A School of Schools, Part 1: Historical Perspectives at the Swiss Design Network’s Beyond Change conference. Photo Samuel Hanselmann, IXDM. 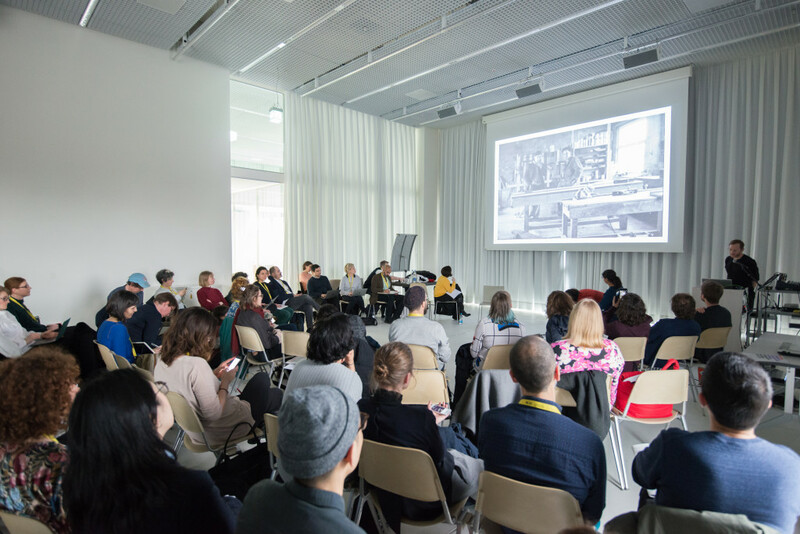 The 4th Istanbul Design Biennial, A School of Schools, was present at the 2018 Swiss Design Network’s Beyond Change conference in the form of a double session exploring historical and contemporary design education alternatives in order to reflect on the role of design, knowledge, and global connectedness in our contemporary context. The sessions explored the complexities of past and present educational initiatives. The first session, titled Historical Perspectives, included presentations by James Langdon (speaking in the image above), Livia Rezende, and Zara Arshad. It focused on alternative design education initiatives taking place in South America, Western Europe and South Asia. Presentations explored diverse pedagogical positions and their spaces of agency, and reflected on what we can learn from them in our current times. The second session, titled Contemporary Alternatives, included presentations by Prem Krishnamurthy, Merve Bedir and Benjamin Foerster-Baldenius, transdisciplinary practitioners whose approach is reinforced and permeated by learning. We looked at a research institute that doubles as a community action center and laboratory of learning; a site-specific offshore laboratory and educational experiment that engages multiple educational institutions; and a year-long initiative for a space for production, presentation, and potential pedagogy. These practices create new knowledge, search for alternatives to implemented systems, and, with radical diversity, push the boundaries of design. The sessions were moderated by Jan Boelen and myself, and sought to make public part of the research that will lead to the biennial opening later this year in Istanbul. Thank you to the organizers, and especially Nina Paim and Claudia Mareis, for the opportunity to bring the discussion surrounding A School of Schools to Basel!